WASHINGTON, D.C. -- U.S. small-business owners are more optimistic about business conditions now than at any point in the 15-year history of the Wells Fargo/Gallup Small Business Index. In the latest quarterly survey, which measures small-business owners' attitudes about a wide variety of factors affecting their business, the overall index score is +129. This is up from the prior record high of +118 established last quarter. Confidence among small-business owners has improved steadily in 2018, and now sits well above the pre-2018 high of +114 from 2006. The current survey was fielded Nov. 8-14, just after the midterm elections. 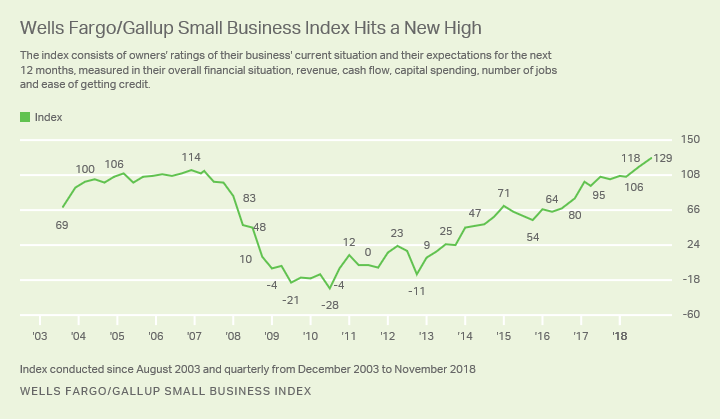 Eighty percent of small-business owners rate their company's financial situation as very or somewhat good, the highest in index history. Seventy-four percent of owners rate their company's cash flow as very or somewhat good, up from 69% the previous quarter -- another record high. Small-business owners were also asked about their projections for 2019, and the responses suggest a modestly optimistic outlook. Thirty-three percent of owners say they are more optimistic about their business' future going into 2019 than they were going into 2018, while 16% say they are less optimistic. The majority (51%) say their outlook is about the same going into next year. While most small-business owners are either positive or neutral about their outlook for 2019 compared with their optimism going into 2018, they are more divided in their views of what the newly elected Congress will mean for their business in the new year. About half of owners (49%) say the actions of the new Congress will have no effect on their business either way, while about as many say these actions will make their company worse off (24%) as say they will make it better (21%). Small-business owners were also asked to name the most important issue they would like the new Congress to focus on in 2019. Owners are clearly most concerned about taxes, with 29% naming this issue. Two other issues were named by more than 10% of owners -- healthcare (12%) and government regulations (11%). Small-business owners were also asked to rate the importance of Congress taking action on a range of issues. The same three issues that topped the open-ended responses are rated as most important in this list: taxes, government regulations and healthcare. Owners attach the least importance to congressional actions on infrastructure, immigration and increasing the minimum wage. Thinking ahead to when the new Congress takes office early next year, how important will each of the following be to your small business? Will actions of Congress on each one be extremely important, very important, somewhat important, not very important OR not at all important to your business? The Wells Fargo/Gallup Small Business Index includes an open-ended question asking owners to name the most important challenge facing their business. In the current update, owners remain most likely to say that hiring -- finding and retaining qualified workers -- is their greatest challenge, with 18% again citing this as their top concern. Hiring emerged as small-business owners' top concern in the second quarter of 2018 and has subsequently remained in that spot. Other frequently mentioned challenges today include finding and attracting customers, taxes, government regulations, and maintaining cash flow. 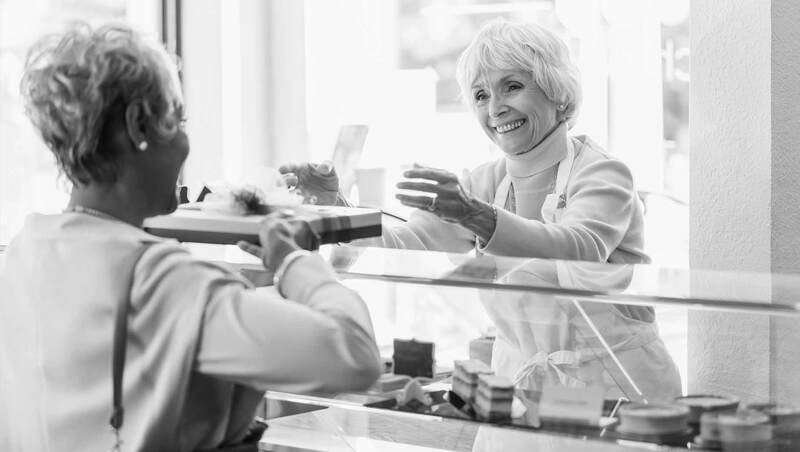 Small-business owners are very positive about their current operating environment, with high ratings on finances, cash flow and revenue driving their overall record optimism. A third of owners say they are more optimistic about the coming year than they were going into 2018, with the majority saying they are neither more nor less optimistic. The newly elected Congress produces mixed reactions among owners. About half say it won't affect their business either way, but slightly more believe it will have a negative rather than positive effect. Owners' overall mandate to Congress points more to the tax situation than anything else, followed by their desire that Congress focus on government regulations and deal with healthcare costs. As has been the case in recent quarters, the prosperity being felt by these owners has its downside; owners continue to say that being able to find, hire and retain qualified employees is their biggest challenge. For more information about Wells Fargo Works for Small Business, visit http://wellsfargoworks.com. Follow us on Twitter @WellsFargoWorks. Results are based on telephone interviews with a random sample of 601 U.S. small-business owners in all 50 states, conducted Nov. 8-14, 2018. For results based on the total sample of small-business owners, the margin of sampling error is ±4 percentage points at the 95% confidence level. Nearly half of U.S. small-business owners give the current presidential administration an "A" or "B" grade for its first year performance.